CraftResumes.com is a relative newcommer, but their online reviews seemed fairly solid. The resume writers I spoke to claimed there were some good people behind the company. The price. It's a bit low based on industry standard and they are giving away way too many things for free. I'm all for getting a deal, but if at prices that low how can they afford to pay professional writers? Their reputation remains high in the industry however, so I've upped their ranking. As I say, CraftResumes.com has only been around for a few years, but the writers I spoke to say you can trust that they are not going to fold up shop while working on your resume. CraftResumes.com offers a bunch of things that make them unique. They offer an in-depth personal interview with the writer, which most sites don't offer anymore. You have 4 days to request a full refund after getting your draft. While the offerings are slim in terms of packages, CraftResumes.com is taking steps to be innovative and to set themselves apart from the pack. In-depth interview with the writer. If you'd like to view some of their work, CraftResumes.com has a small library of Sample Resumes provided by specific writers. As discussed above, I feel as though their pricing is suspiciously low and to pay a professional writer I would expect to pay more. 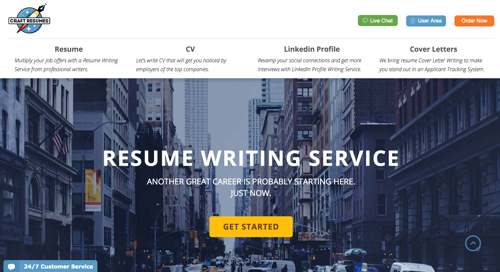 CraftResumes.com is also affiliated with the Professional Association of Resume Writers and the Association of Professional Resume Writers.